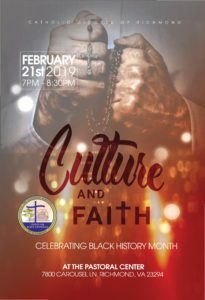 The Catholic Diocese of Richmond has the honor of inviting Father Kenneth Gaddy C.Ss.R from the Archdiocese of Baltimore to be our keynote speaker for this talk. He will dive into the history of the Redemptorist priests in the Diocese of Richmond and their work, impact and accomplishments with Black Catholics. We will also have food and live music! All are welcome!